Weevils infesting stored grain pose a threat to grain quality and present a specific set of challenges when trying to control these insects. As weevils proliferate across the U.S., identifying, preventing and managing weevil infestations all contribute to maintaining the quality and profitability of your grains. Weevil infestations can cause severe damage to stored grains. Weevils are quite evasive as the female insect bores into kernels, depositing larvae inside and sealing the hole. Immature weevils develop inside the grain kernels and emerge as adults which makes them difficult to control. Typical signs of a weevil infestation include heat at the surface of grain, a “shot hole” appearance in grain and the presence of adult weevils. The two most common species of weevil are rice weevils, Sitophilus oryzae, and granary weevils, Sitophilus granarius. Rice weevils have small snouts and dull red-brown or black colored bodies. Their backs feature four light red to yellow markings and functional wings, and they have a densely pitted thorax. Rice weevils are strong fliers, allowing them to easily move from one location to the next. Granary weevils, Sitophilus oryzae, have cylindrical bodies that are shiny red-brown or black. They have snouts and ridged wing covers, and their thorax is marked with oval pits. Granary weevils cannot fly. The primary and most effective means of controlling weevils in your stored grain is to take preventative steps. To help prevent weevil infestations, clean and treat all empty bins thoroughly, including walls, floors, cracks and crevices, prior to loading in grains. For these applications, we recommend applying a tank mix of Diacon® IGR PLUS and PBO-8® Synergist to areas previously mentioned as well as the grain handling equipment. Do you have untreated grains already in storage with a weevil infestation? 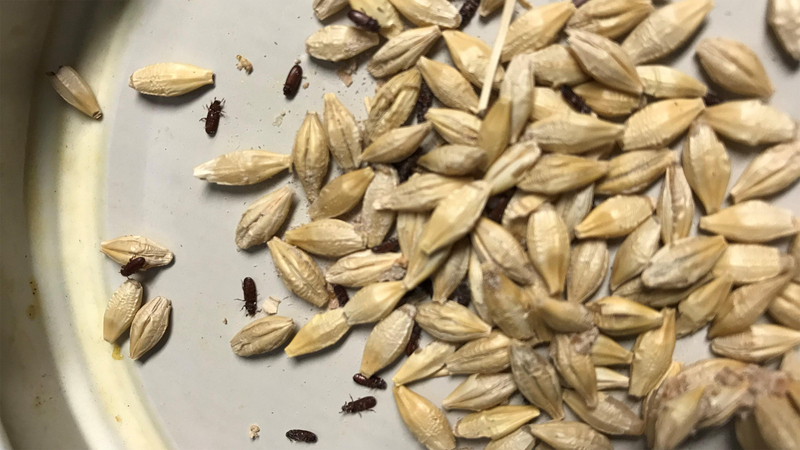 If there are signs of weevils in stored grain, turn and treat the grain with Diacon® IGR PLUS and PBO-8® Synergist or with a rescue treatment of Centynal™ EC Insecticide and PBO-8® Synergist. For severe weevil infestations, consider treating with an EPA-registered fumigant. When applying Diacon® IGR PLUS or Centynal™ EC Insecticide for the control of weevils, it is important to incorporate PBO-8® Synergist. PBO-8® Synergist boosts the active insecticide ingredient in each product, significantly improving the effectiveness against the difficult-to-control weevil. As with any effort to control insects in stored grains, a comprehensive integrated pest management (IPM) approach is recommended. The S.L.A.M. approach to pest control involves proper practices in Sanitation, Loading, Aeration and Monitoring. Sanitation practices include cleaning and repairing storage facilities. When loading the grain into the bin, all received grain should be treated with protectants to prevent an infestation. Aeration will keep grain temperatures low during storage. Finally, monitoring the grain helps to stay ahead of potential problems. For more information on weevil control strategies, download our fact sheet and watch our informational video. Stay up to date with the latest information and tips on how to keep bugs off your grain.